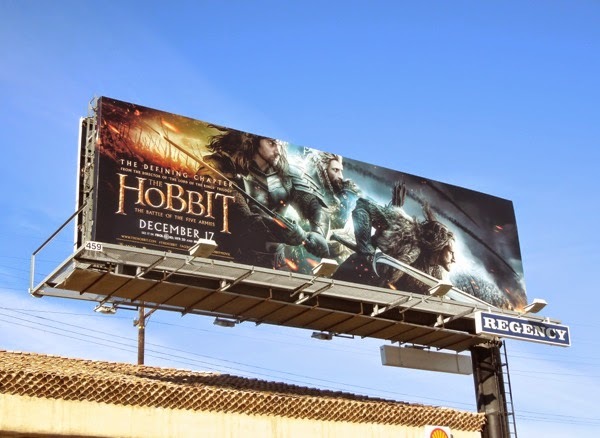 This holiday season another epic tale draws to a close as The Hobbit: The Battle of the Five Armies bits cinema screens and the skies of L.A. with this highly visible outdoor ad campaign. 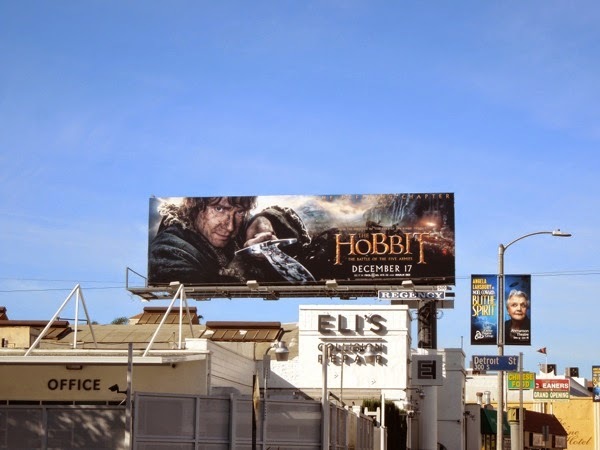 Originally subtitled There and Back Again (which is much more Hobbit speak), the third installment in The Hobbit trilogy now has a much more marketable bombastic Hollywood title, which is a shame. 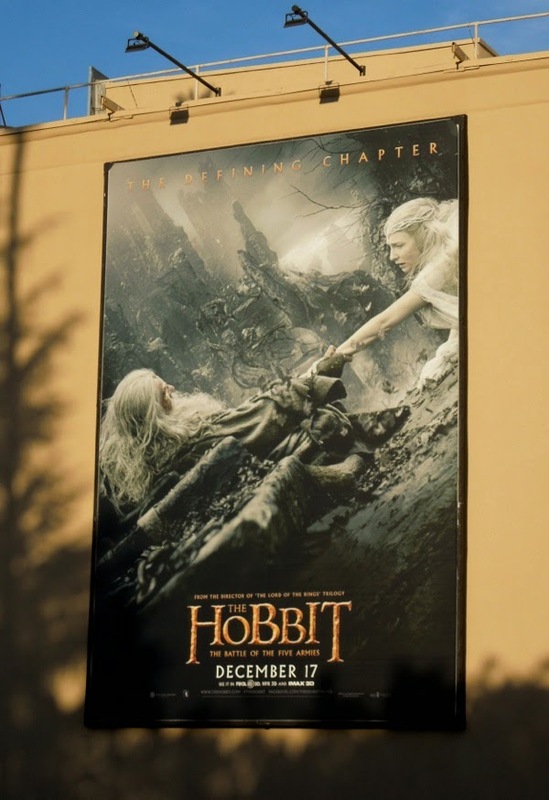 Not only have they tried to make this movie sequel much more tonally like The Lord of the Rings trilogy with more epic battles, but they've also included more familiar Tolkien fare like Cate Blanchett's lady elf, 'Galadriel' and mythical beasts, the Great Eagles, to draw fans of Middle-Earth in. 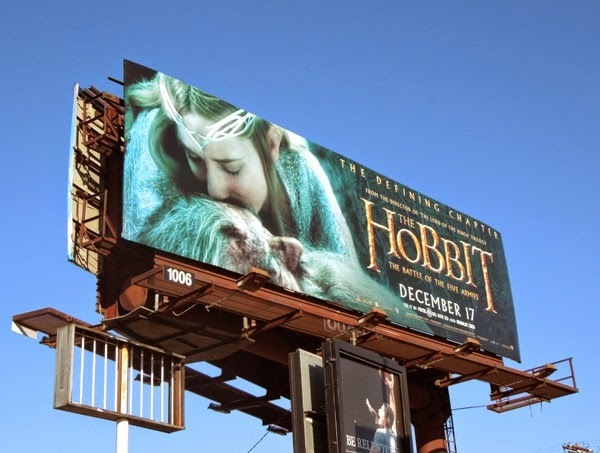 Fortunately no one had the bright idea to split the final film in two, as even though it may have brought in extra bucks at the box office it can sometimes leave a sour taste in the mouth of audiences, like The Hunger Games: Mockingjay Part I recently did. 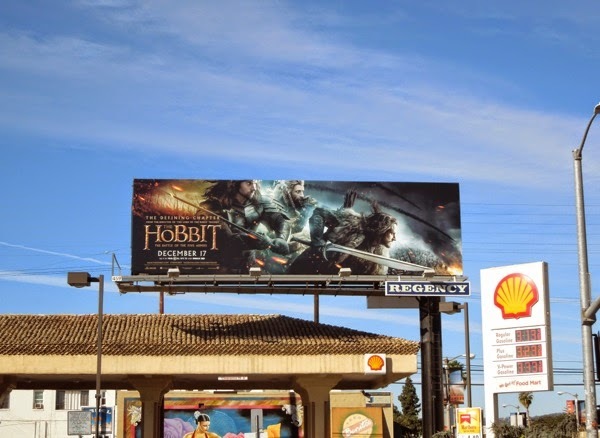 There's nothing worse than a rabid fanbase, although a giant fire-breathing dragon called 'Smaug' is actually much worse, so in this movie we'll see how 'Bilbo Baggins' and his company of Dwarves defeat the ancient terror and how they try and protect the vast treasure beneath the Lonely Mountain from the likes of Orcs, Man and Elves. 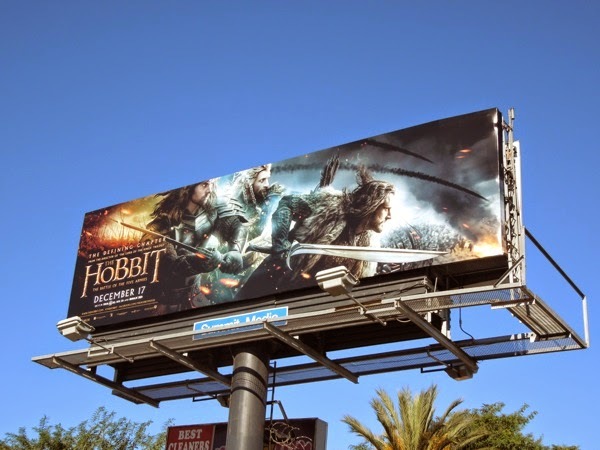 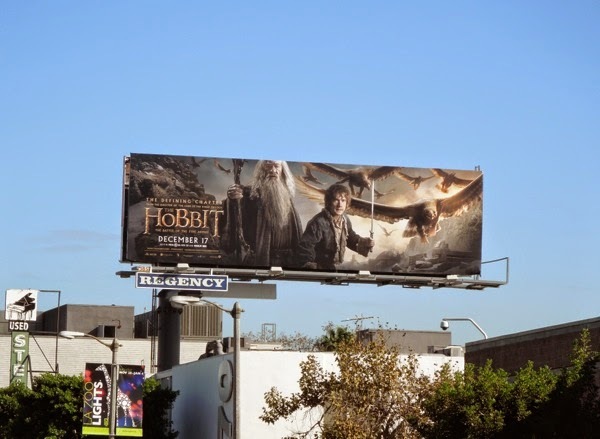 This array of billboards for The Hobbit: The Battle of the Five Armies were first spied in locations along Melrose and Beverly Boulevards on November 19, with others spotted through November 27, 2014 at Warner Bros. Studios in Burbank, along L.A.'s 3rd Street, Fairfax Avenue, La Cienega Boulevard and Highland Avenue. 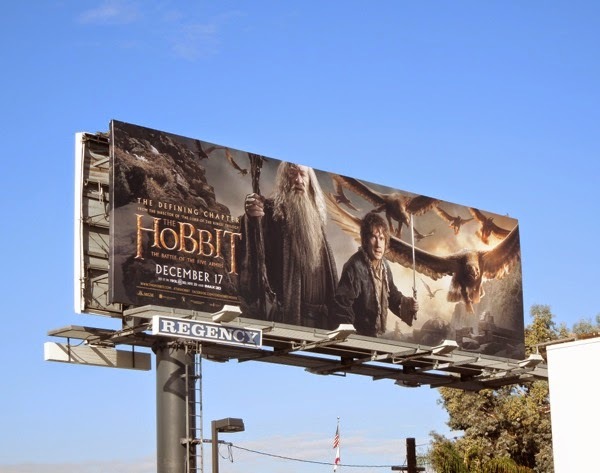 If you're a fan of these films inspired by J. R. R. Tolkien's books, be sure to also enjoy these billboards for The Hobbit: An Unexpected Journey and The Hobbit: The Desolation of Smaug. 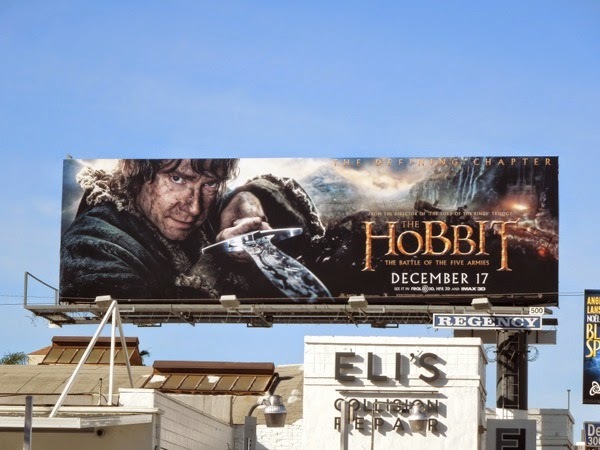 Can the races of Middle-Earth unite against the growing evil of 'Sauron' before it's too late? 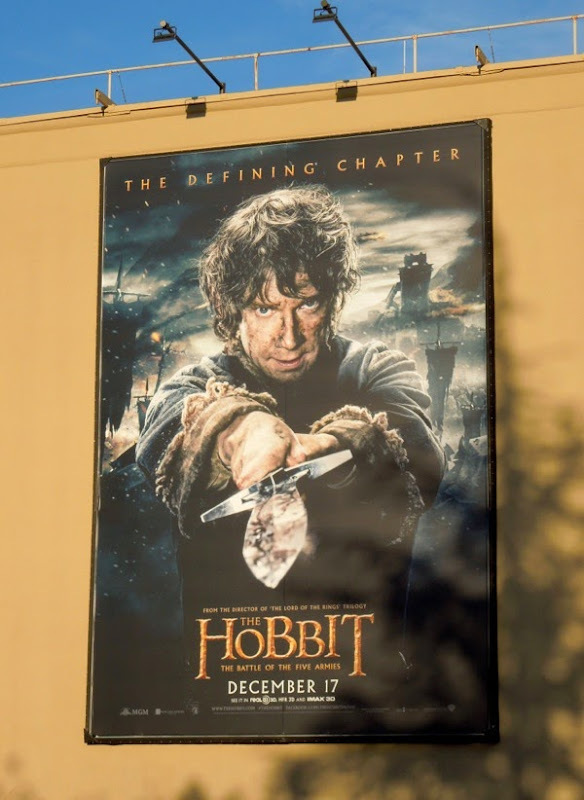 You'll just have to watch Peter Jackson's epic fantasy finale to find out. 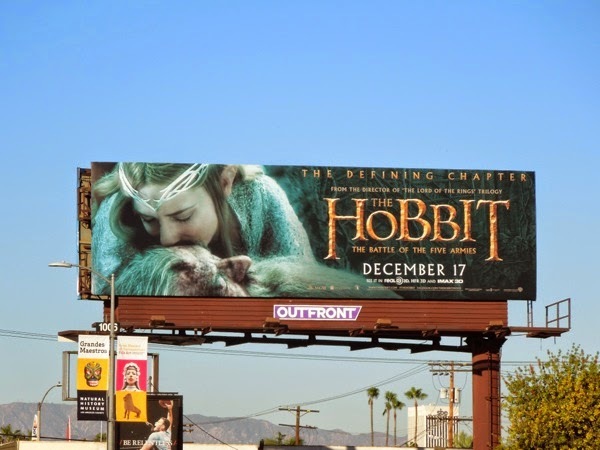 The real question is, will this be the last we'll see of Tolkien's world, or will Warner Bros. Studios decide to continue the franchise with a post LOTR totally original trilogy, because some people can't get enough elves, dwarves and orcs. 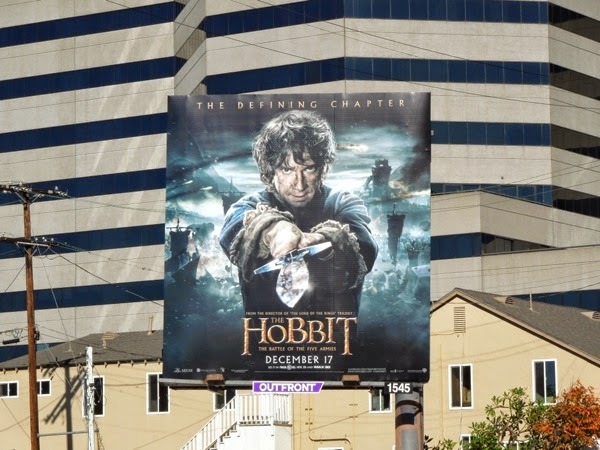 UPDATED: Here's another billboard featuring Bilbo Baggins in solo action snapped along Olympic Boulevard on December 13, 2014.